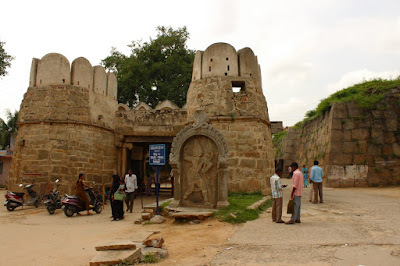 Penukonda was the second capital of Vijayangara, it became the capital after the fall of glorious Hampi. 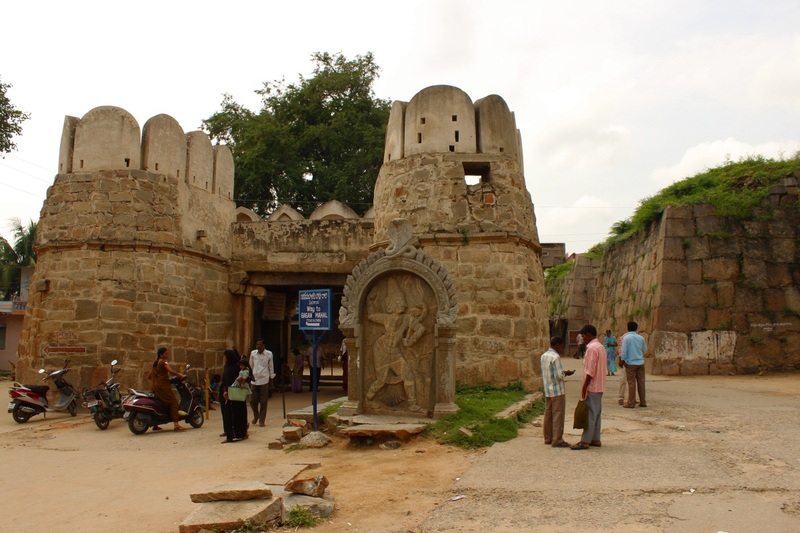 Penukonda was a flourishing city too, its fort spread over hills and plains. 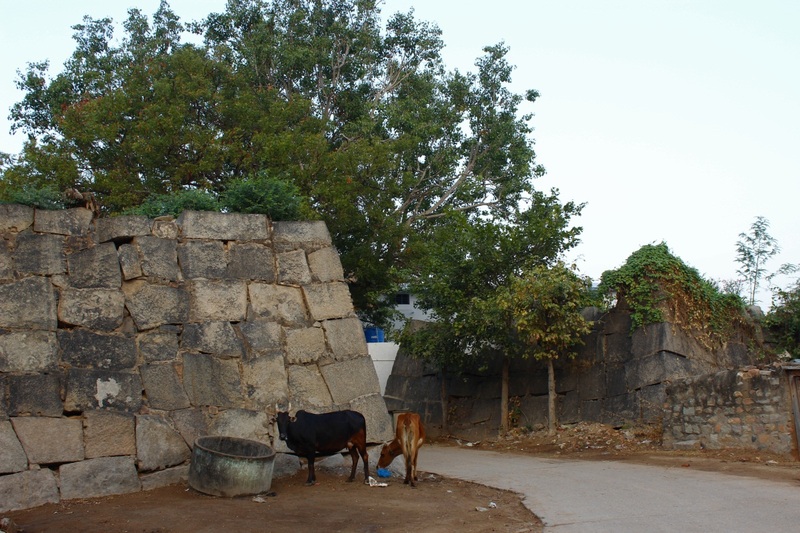 Within the fort are several temples, tanks and wells and even a summer palace. About 30 kms south of Penukonda is Lepakshi, the home to largest Nandi, a huge Shiva Linga and Maha Ganapati. Lepaksi's Veerabhadra temple is popular for its exquisite sculptures and the unique designs on it\s incomplete Kalyan Mantap. It is said that Lepaksi was built by the prime minister Thimmarasu. Due to misunderstanding Thimmarasu and his family were wrongly accused of conspiring against the king and swindling the kingdom's treasury. 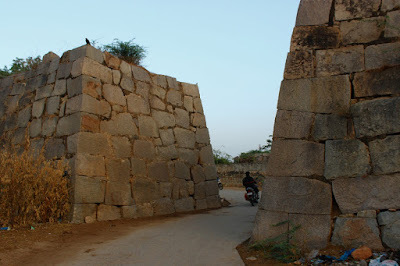 Thimmarasu was blinded and imprisoned in a jail which is located at Penukonda fort, very close to Gagan Mahal the summer palace. 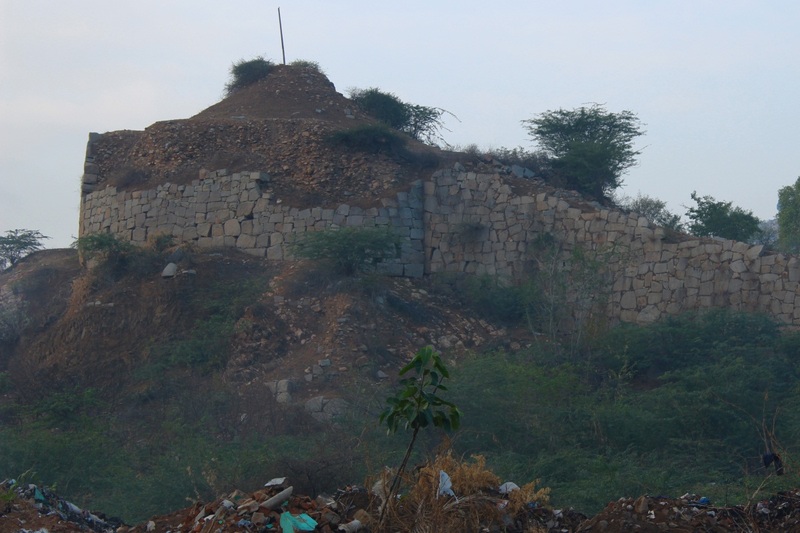 Within the fort in the plains is a Jain Basti too. During two of my journeys between Bangalore and Hyderabad, I'd stopped at Penukonda. 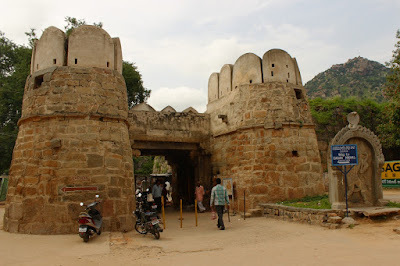 During the first visit I'd entered via the fort's eastern entrance, saw Gagan Mahal from outside, Kashi Vishwanatha temple, Ramaswamy temple, Thimmarasu jail and Narasimhaswami temple on the hill. During the second visit with Pushpa in company, I could see the inside of Gagan Mahal and discovered two more monuments the water tank, Basava Bavi and also the northern entrance to the fort. 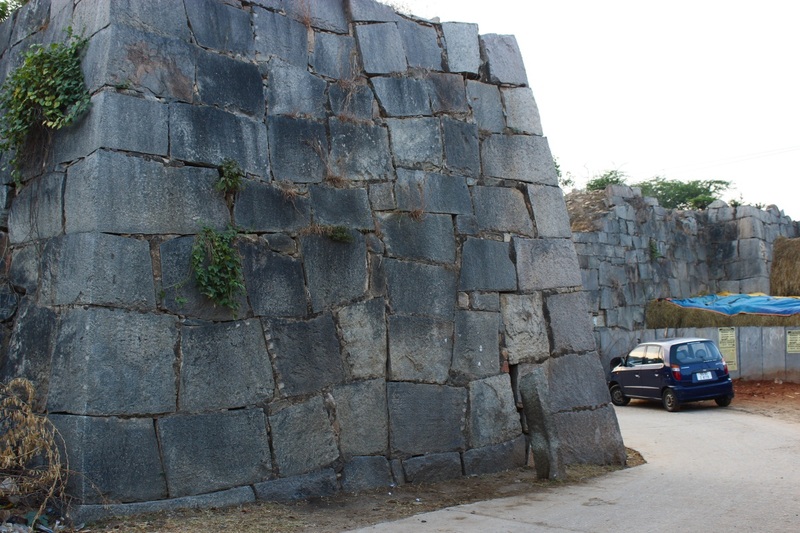 So here's the northern entrance to Penukonda fort, flanked by bastions. Within the gateway is a temple. The gateway is isolated from the main structure to make way for incoming and outgoing traffic. These rampart walls are original walls, built during Vijayanagara times. The eastern entrance is similar to the northern entrance but there's no gateway as such, not even ruins. 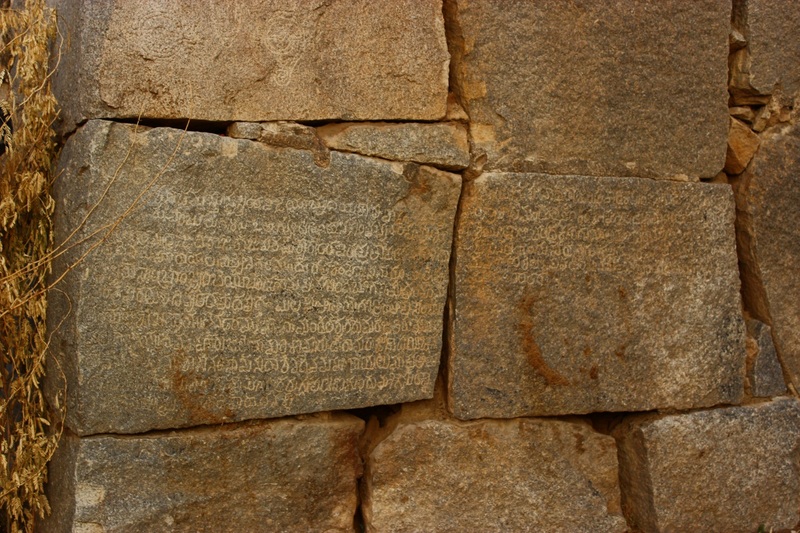 On the walls are several inscriptions in Kannada. 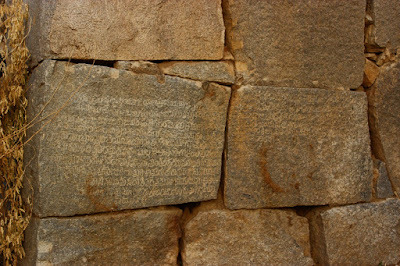 Kannada epigraphy on dressed granite blocks. Another view of the rampart wall. Large dressed granite block fir into each other perfectly. Many parts of the fort area is occupied by homes, especially the walls are conveniently used to support shelters for cattle. 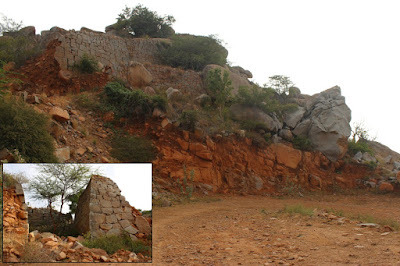 This crumbling structure is probably the highest part of the fort on plain land. What seems like a flag bastion is a part of the eastern wall of Penukonda fort. The fort on the hill is accessible by two ways- by foot and by road. 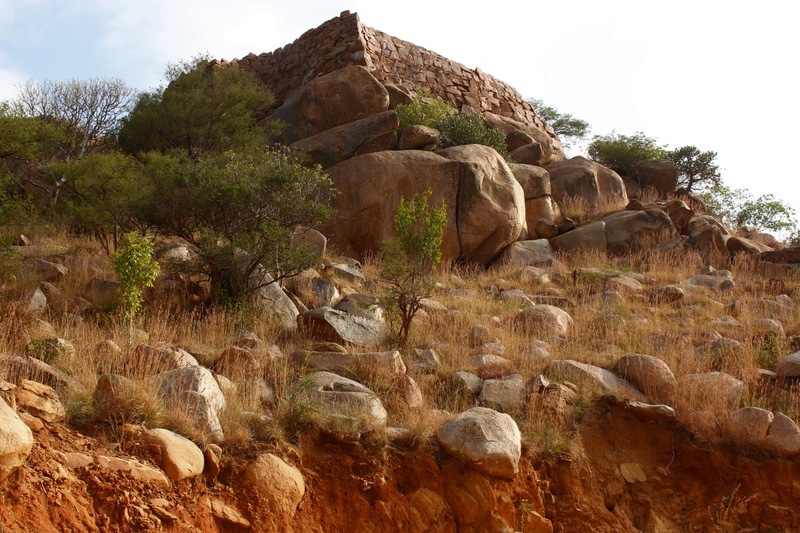 If you wish to climb the fort by foot, the path starts near Gagan Mahal. One day I really want to climb here which leads straight to the highest part of Penukomds fort. I took the road, drove up the recently formed twisty dirt track. On the way I could see ruins of walls and gateways. 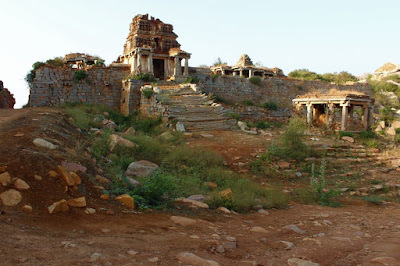 The ruins include post Vijayanagara construction too. 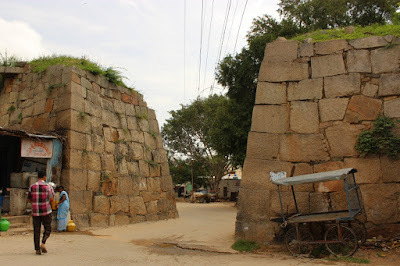 The wall seen here seems like it was built during Hyder-Tipu rule. The road ends at Narasimhaswami temple. 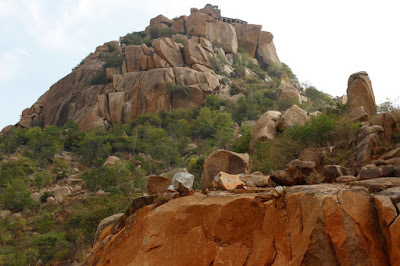 The peak of Penukonda fort is a kilometer from here and can be reached by foot only. A third visit to Penukonda fort is pending just to reach the highest point. On the way down, I noticed two badly damaged Mohammedan tombs. Probably members of Hyder-Tipu family ot some high ranking military personnels'. 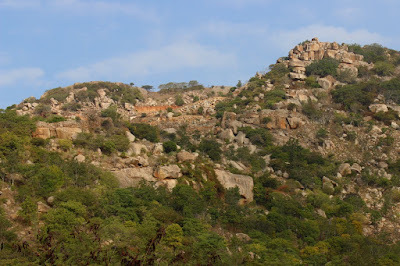 This is a rocky hillock marked as Babaiah Konda. At its summit is Dargah of Hazrath Baba Fakruddin a Sufi saint of 12th century. 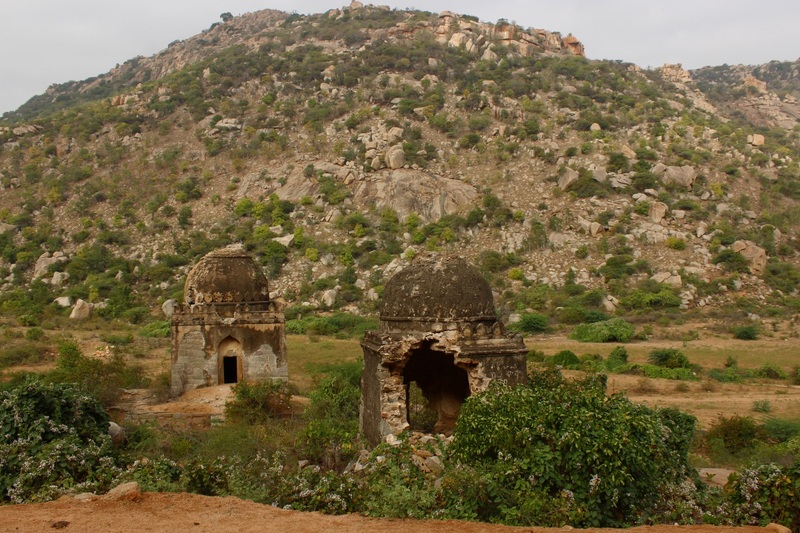 It is said that he was a king of Sistan and Shahpur in Iran before he came to Penukonda. Even this climb should be an interesting one. Hopefully someday I should be able to climb this too.